The new Lync 2013 clients require Lync Server 2013 with CU1 installed or they will not connect (they will return an “incorrect version” error message). This includes the Lync 2013 Edge server. Here is a good blog entry explain this: Why is Lync 2013 Mobile asking me to use Lync 2010? I have heard several reports that the Windows Phone 8 update is only currently available in the US and Canada. Other regions will likely get an “App not available” error when trying to install. I am not sure when other regions will become available. The iOS clients require iOS 6.x. You can read more about the recent Lync 2013 Mobile Client release in the Next Hop article here: http://blogs.technet.com/b/lync/archive/2013/03/11/lync-2013-mobile-apps-available-for-windows-phone-and-ios.aspx. As expected at the Microsoft Lync 2013 Conference, the new Lync 2013 Mobile Clients were announced with live demonstrations and the headline feature is support in the Lync 2013 Mobile clients for voice, video, and data collaboration over IP on all major devices allowing Lync voice and video calls over WiFi, 3G, and 4G. This is significant and truly brings full mobility experience to Lync. 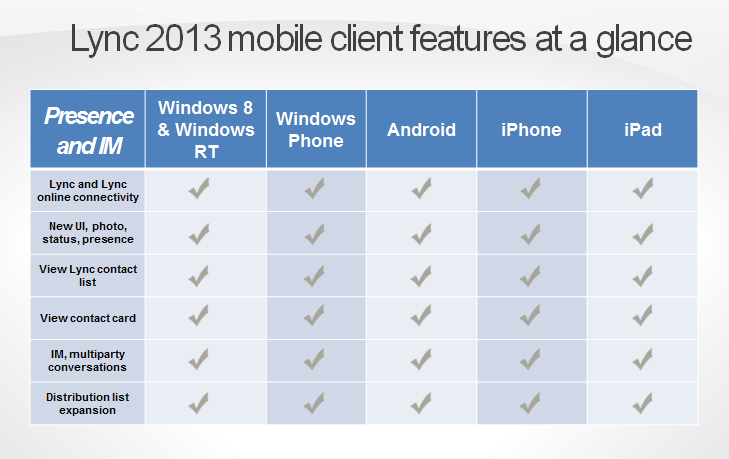 No specific release dates were given, but the new Lync 2013 mobile clients for the iOS (iPhone and iPad) and Windows phone are expected in early March. The Android client is expected in April. Screenshots of the new clients are included below. The Lync 2013 iPad client demonstration was impressive. In addition to voice and video over IP, users can also share desktops and applications in the Lync meeting experience. The Lync 2013 mobile clients will need CU1 installed on the Lync 2013 server to stream the audio/video. Read “Why is Lync 2013 Mobile asking me to use Lync 2010?” for more information. In the testing done to-date the battery usage has been very good (even on the iOS). The push notification methods are proving to be very efficient. Microsoft is not leveraging Apple’s push notification service; they have their own. BlackBerry is on the roadmap, but there are no timelines but Microsoft is actively looking at. Desktop and application sharing for all major smartphones are on the roadmap for the future. We have Lync 2010 server at work, however I use the 2013 desktop client. When I found that a 2013 mobile client (iOS) was available I was excited that the new app would support the iPhone 5 resolution and promptly installed it. Unfortunately I found (as mentioned above) the new mobile clients are not backwards compatable like the desktop client. Any thoughts on adding backwards compatability (I like the 2013 new UI) or supporting the iPhone 5 resolution in the 2010 client? First of all, great summary. One thing I’ve been trying to find out is will the new Lync 2013 mobile client finally support using certificate as authentication and not just username password? We don’t have passwords since we use smartcards on our computers, on activesync this work just fine. Hi Curtis, thanks to let us know this. I can’t believe that Microsoft is doing this. I’m working in an Enterprise Environment where it is not easy to go to all these steps to achieve a Lync 2013 as we are coming from OCS2007 Server. There is a huge benefit to have this also under 2010. Will take care about it! Upgrades are never easy; especially in an enterprise environment as you mention. IMHO however, Microsoft has invested a lot of work and resources building the new mobile clients and the new feature set (e.g. VoIP) and I can understand why they wouldn’t want to invest even more (in dev and testing) to support a pior *release* of the server backend. Customers always have the option of using the existing Lync 2010 Mobile clients with Lync Server 2010 until they can upgrade to Lync 2013.
any Information about backward compatibility on Lync 2010 Infrastructure for the new client!? Hi Alex, good question – I have updated the post to answer that. In a nutshell, users cannot sign-in to a Lync 2010 Server with the upcoming new Lync 2013 mobile clients and if they try to do so they will be told that with an error message and asked to use the Lync 2010 clients. There is a table under the “Server Compatibility with the Lync 2013 and Lync 2010 Mobile Clients” section which explains the behavior with the different mobile clients and server versions.